This is a post on public toilets in India. I am assuring you that this post will not stink. So you can still read it with your nose and eyes open. When ever you go to a bus stand in any place in India, you can smell the collective urine smell of all the people in that particular city because of the existence of the public toilets in the bus stands. Talking about public toilets, the train toilets have the same effect on people. The only toilets that are bearable are the ones in movie halls. They have music played in the toilets. The following pictures speak a lot about weird public toilets. The college certificates of the engineer who designed the above urinals should be verified. I am sure he has a fake certificate. 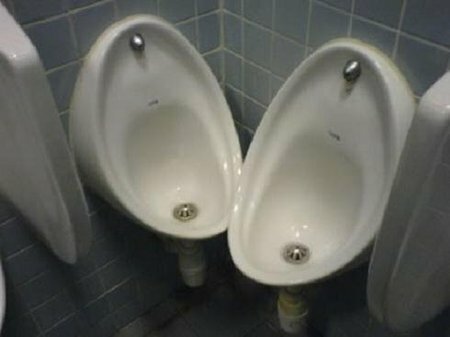 How can two people use this urinal at the same time? There are a few ways to use these two urinals at the same time. 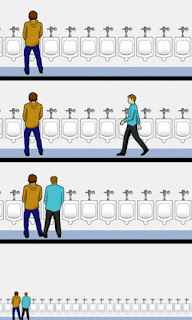 1) The two men should stand at least 4 feet away from their respective urinals and they should have a good aim. Care should be taken to see that they don't pee on each other. 2) Both the men can stand closer to their respective urinals on one leg. The other leg can be placed on the urinal itself or can be kept on the wall. 2) Do you spit gums in the urinal? In most of the urinals you can see two or three chewing gums. That's where 80 % of the chewing gums finally end at. Back in my college, we were asked to take the chewing gums with our hands if we spat them in the urinals. 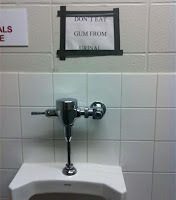 Recently when I saw the above picture, I was shocked to know that there are people who eat those chewing gums too. I had a friend Raju who used to take chewing gums from under the class benches and eat them. 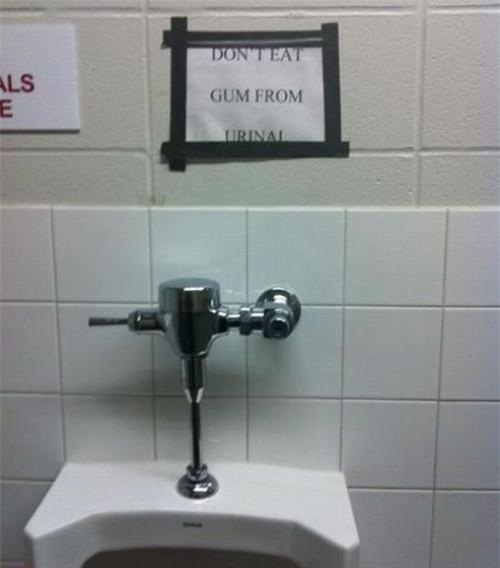 But who on earth would a person eat chewing gums from the urinals? Still there might have been cases of people eating from urinals and that might be a reason for such a strict sign board. In public urinals, one can see urinals for small children and for adults. They are placed at strategic places for people to use. But this urinal which is placed at 7 feet height is dedicated to the WWE wrestler Khali. Even he needs a chair to stand and pee on this urinal. Because of deforestation and because of concrete jungles cropping up, the water resources are becoming scantier everyday. There have been many "save water" campaigns that were made to make people understand what lies ahead for them if they do not save water. What is mentioned in the picture is also a possibility in the future. Our former Prime Minister Morarji Desai drank urine. Probably in future, urine might become a drink too. 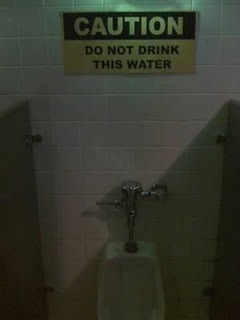 So if you don't want to end up drinking your own urine, "Save water". Every man reading this article would have come across this guy. He will be there in every public urinal. He would peep into your urinal section while you are performing your act. I don't know why he does that? Does he gain wisdom by looking at some one else's private part? I don't know . But there are people who do that. They might not be gay. But still they do that. Do they have a complex problem? I don't know. But they do. If you want to know why they do that, go to a public toilet and someone would do that to you and when you do that, please ask them why they do that? Please let me know what their answer is. In a public toilet, if you are the only person using the urinal you feel like a boss. You would feel like the owner of the place. But when suddenly another person enters the urinal, you would feel like losing your private space in your own world. The problem happens when that person chooses to use the urinal which is next to the one that you are using. Such a person is 100 % gay. Never ever entertain them. They also do the same thing that peeping toms do. But a gay person would also look and smile at you. Not all peeping Toms are gays. But all gays are peeping Toms. Every single Indian male would have done this. Yes! Peeing in public. It comes so naturally to us. It is a punishable offence in many countries. But in our country, it is everyone's birth right because when you have to go, you really have to go. There are some "Moothira Sandhus" (Urinal streets) in Chennai. If you could walk through the street without closing your nose, you should have a strong heart. Recently I went to a hotel to have dinner. I have the habit of drinking lots and lots of water while eating and as a result my bladder became full. So I decided to use the rest room. The rest room was so neat and I did not find any mistake in the rest room. I went back to my seat and started eating food. Once I was done with eating I went back to the wash room to wash my hands. I saw a note that read "Keep your hands. Soap will Come". I waited there for a long time and the soap never came. Finally the bearer came and woke me up and told me to use the liquid soap container. The sensor soap was removed from the original place he said. Moral of the article: Don't be innocent like me. No 3 and 8 ROFL. You have a way with making the most dreadful topic, comical. I agree with whatever you are saying. Now don't think that I've been to a men's rest room. Just saying. Chriz your time permits to research on all this too? great da i shud come and take some lessons too. 'complex problem' ROFL.. chriz epdi ipdi laam.